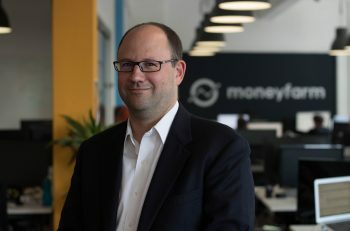 Headed up by our Chief Investment Officer, Richard Flax, our asset allocation team monitor the markets on your behalf, analysing market movements against the long-term goals of your portfolio, helping you stay one step ahead. The fourth quarter of 2018 was uncomfortable. After an unprecedented period of calm on the financial markets in 2017, increased global uncertainty and growing cyclical concerns caused increased volatility in the markets. 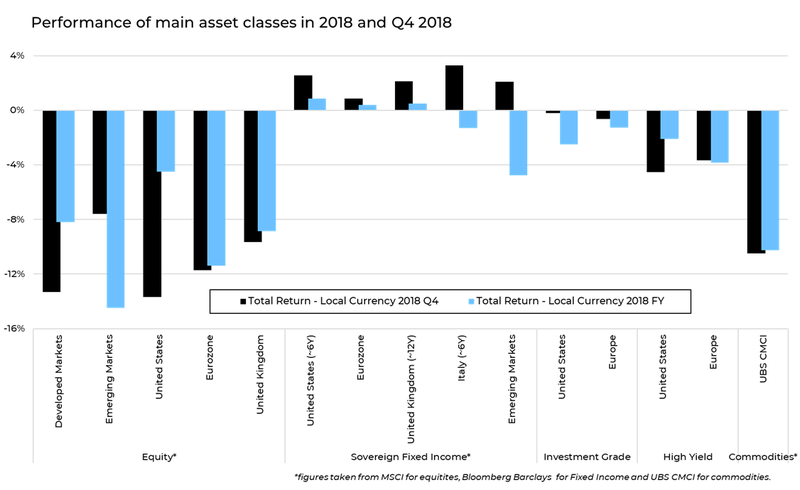 Translating into one of the worst quarters of the last decade, few asset classes remained unscathed as the New Year was ushered in. Discussions at our Investment Committee reflect this shifting landscape. As ten years of robust economic growth shows signs of strain, the global backdrop begins to crack under the pressure. Growth in the Eurozone and Emerging Markets has disappointed and even the US, which seemed immune to global pressures for the majority of 2018, flashed warning signals from the manufacturing and transport sectors by the end of the year, although employment levels remained strong. Investors will have to navigate both an uncertain backdrop and cyclical pressure in 2019, but there will be opportunities for growth. If Central Banks manage their monetary policy programmes well, trade tensions ease and Brexit negotiations lead to a solution that’s welcomed by markets, financial markets could rebound. Most will recognise that tensions on the global stage didn’t emerge over night. Yet financial markets chose to ignore this unpredictable backdrop for a number of consecutive quarters, favouring unusually low levels of volatility instead. A complex picture has now emerged. Growth concerns were exacerbated by the medley of political tension, triggering an accelerated repricing of equities in the fourth quarter, shifting valuations south. Equities had previously traded at historically lofty valuations, supported by strong earnings growth. However, this earnings momentum has shown signs of reaching its peak, just as equity valuations have slumped. The Brexit countdown is entering its final weeks, and after close to two years of negotiating, the potential outcomes are still too broad to say with any certainty. In the Eurozone, Italy has faced budgetary headwinds from the European Central Bank (ECB) and violent protests erupted in France against the cost of living, calling for President Macron’s resignation. Across the pond, the midterm elections handed control of the House of Representatives back to the Democrats for the first time in eight years, with the paralysis of the US budget indicating that the next year is likely to be a difficult one for President Donald Trump. Trade issues escalated over the course of the year, the impact of which are already being felt on both sides of the commercial spat – headlines around the impact on US farmers were popular in the quarter. The costs of shipping from China to the United States rose and American giant Apple, a symbol of the decade-long bull market, revised its Chinese sales forecasts, with painful consequences on the stock market. Then there was the arrest of a senior executive of Chinese technology champion Huawei at the request of the American authorities, all whilst Trump ate dinner with Xi Jinping at the G20 summit. Trade negotiations are ongoing and whilst there may be some progress on trade, other issues like Intellectual Property protections may be tougher to resolve. Uncertainty in the US managed to knock Brexit off the front pages for a couple of weeks, but it’s still going to be a major event for the first quarter of 2019. With less than 100 days on the calendar until the UK is set to leave the European Union, the outlook is no less uncertain. The story changes by the hour: whether it’s the date of the Parliament vote, Theresa May’s attempted No Confidence coup, the details of her deal, or the opposition’s response to it. The uncertainty is very difficult for financial markets to price in. The consensus is that a No Deal will be bad for markets and the economy, and there is a large bias against a No Deal. We see this reflected in sterling, which depreciates when the risk of No Deal increases. If we do see the deal passed, we’d expect financial markets to take that quite positively, as it removes some of the uncertainty that we’ve had to live with over the past few months. Since the referendum result was announced, we have been adjusting portfolios to limit the downside and capture as much upside as possible in the final Brexit outcome. We’ve maintained our low exposure to UK-focussed risky assets and have taken steps to remove our vulnerability to currency volatility. If you have any questions about how your portfolio is prepared for Brexit, get in touch with your Investment Consultant, who will be happy to talk it through. Rarely is one quarter so heavily directed by one theme, yet America’s Central Bank, the Federal Reserve, had financial markets hanging off its every word in the final three months of 2018. During periods of uncertainty and tension, investors look to Central Banks to support the economy with loose monetary policy to promote expansion – although it’s not in the Fed’s job specification to manage market volatility. Yet global policy makers want to return to normal monetary policy after an unprecedented programme of policies designed to promote economic expansion following the financial crisis. The Fed hiked interest rates in December’s final meeting of 2018, and although the move was expected, the unanimous vote spoke to investors’ nervous disposition. The markets had prepared for four interest rate hikes in 2019, yet a shift in the political and economic backdrop translated into a softer outlook for monetary policy. In response to market volatility, Federal Reserve Chair Jay Powell reassured investors that the Central Bank wasn’t prepared to complete its interest rate programme at all costs, and would listen to the wider economic scenario before making any concrete decisions. Fed members now expect two rate hikes in 2019, down from three in October. The market isn’t as convinced, however, with the probability of no rate hikes in 2019 jumping from below 20% in October to close to 80% probability at the time of writing. The question is whether the Fed will fall in line with the market. For equity markets to recover, the Fed will probably need to signal that it will pause its monetary policy programme. Suffering from one of the worst quarters for ten years, it’s difficult to find many winners in this environment. Developed market equity slipped 13.3% in the fourth quarter, accelerated by a 7.6% decline in December alone. The fourth quarter performance unwound the market’s recovery from volatility earlier in the year, with the sector ending the year down 8.2% in dollars. Compared to the sharp falls experienced in early 2018, Emerging markets held up a little better, although still ended the quarter down 7.6%. Although interest rates still remain at historically low levels, government bonds were stable, confirming their attractiveness as a diversification tool amid uncertainty. The main bond indices of Europe, the United States and Japan closed the year on a positive note, beating all expectations. Investment Grade Bonds benefited most from the fall in interest rates, closing the quarter almost unchanged. It was a different story for corporate debt, however, which suffered from the risk-off environment. Economic weakness did cause demand for oil to fall, removing the support for its price. The commodity index as a whole lost 10.5% in dollars over the quarter. Is this level of volatility normal? Global equities slumped in the fourth quarter, but is this behaviour investors should expect from the stock market? After two years of calm, it might seem rare and will probably feel uncomfortable, but, in reality, markets have fluctuated like this before, and will do so again in the future. Take a look at the distribution of historical returns from the S&P 500 in Chart 2, on a monthly, quarterly, and annual basis. The black line shows the distribution of monthly historical returns, highlighting performance from October, November and December. If you can imagine the 91 year lifespan of the S&P 500 fits into 100 months, December’s performance falls into one of the three worst performances, with October’s performance falling into the bottom six. This won’t be too much comfort, but it should reassure investors that these market movements are not unparallelled. The quarterly performance is also interesting. The S&P 500 slipped 14% in the fourth quarter, but as this is in the bottom 7% of quarterly performances, however, investors should expect three or four quarters of similar returns across a ten-year time horizon. Chart 3 and Chart 4 put the fourth quarter and 2018 performance of the S&P 500 into simple context. Fourth quarter performance was difficult, yes, but investors have sat through similar scenarios before. Volatility on the S&P 500 is measured by the VIX, and is often used as a benchmark for global equity markets. 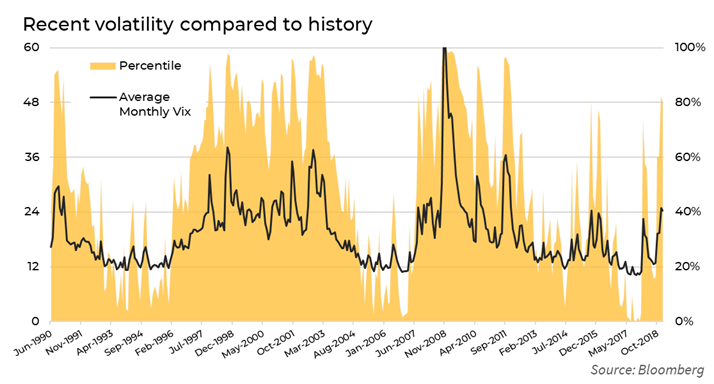 The VIX sat at historically low levels for the entirety of 2017 and early 2018. Looking at Chart 5, you can see that such low levels of volatility is unusual. Whilst the return of price fluctuations will have been a rude awakening for many, this environment has been seen before. In fact, 45% of quarterly volatility levels have been higher since 1990 than what was seen in the fourth quarter of 2018. During uncertainty, many promote timing the market to avoid volatility, yet this tactic comes with its own financial health warnings. Instead, it’s ‘time in’ the market that can provide you with the elusive edge as an investor to maximise your returns. You can see from Chart 6 that the probability of loss when investing in Developed Equities given your time horizon falls dramatically depending on how long you are invested. The longer you’re invested, the less likely you are to see losses in your portfolio. If you’d like to discuss the performance of the model portfolios or want to know the thinking behind the Moneyfarm investment strategy, please call your Investment Consultant on 0800 4334574, or book a call.